As we visited lovely Noora and her grandmother today, great news reached us: Noora can come home with us! For me, it was the first time seeing her in her big cast. After the last intervention she got a new red one. Now it’s also including both whole legs of her. But nevertheless, she was happy and even-tempered. Also her grandmother was grateful as usual and praised God. She’s a real prayer warrior and does everything for her granddaughter. But before we could finally discharge her, a few things needed to be done. First they had to crop her cast, then, most important, we had to meet with her orthopedic doctor. So, we headed towards his doctors office. Cropping the cast turned out to be an horrible time of panicking and screaming. Having this really loud electrical saw sawing so close to her body really scared Noora. 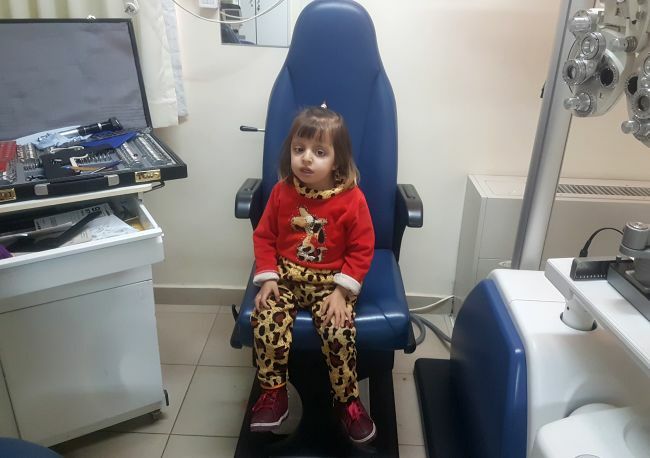 And so her screaming mixed with the penetrating drumming noise till the procedure was finally done – it broke my heart seeing her like this and especially her totally scared eyes. Thank God, Noora with her light spirit laughed again a few minutes later and you couldn’t see anymore fear in her. And as we spoke later with her orthopedic doctor, her CT Scan of yesterday showed her hip in the right place! Thank God! For now, she is just coming with us. In three weeks time we will come again with her to check her cast and her hip. 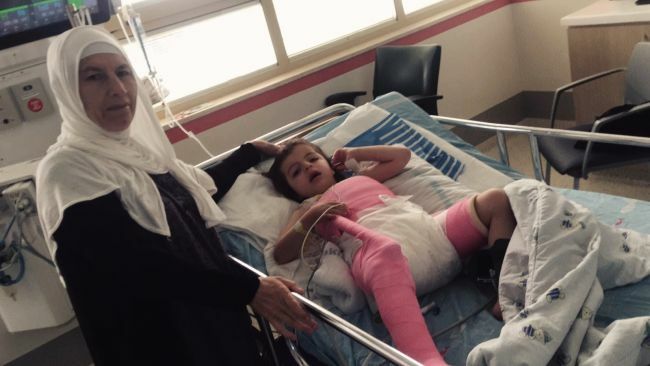 After two more weeks, we will meet again and, inshallah, they’ll be able to take off her cast. Depending on the strength of her bones by that time, she will or won’t have another surgery. But the doctors seemed to be really optimistic about that. Thank God! We can really pray for this special family. May her grandmother receives strength for every new day and Noora a smooth recovery. Coming into her room, Noora was very happy and laughing a lot. She and her grandma seemed very calm about the follow-up treatment. We had a really good time playing with her and we were really happy to see her like that. 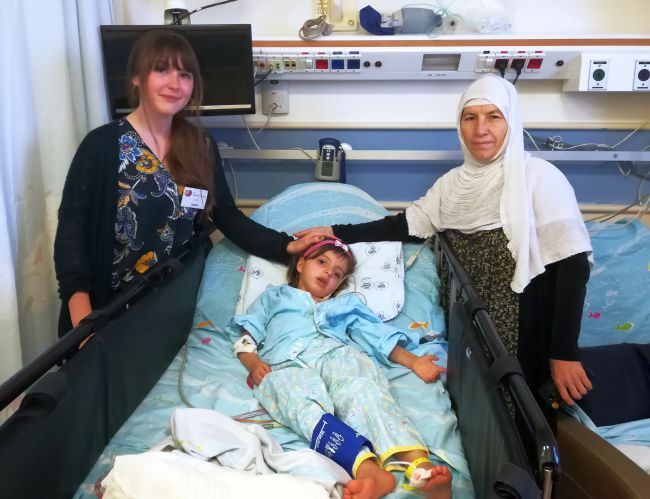 As the time grew closer to the surgery, Noora changed her mood and also her grandma became very serious. During the surgery the grandma was praying and talking with people on the phone. The surgeon finished earlier than expected and also we got to know it wasn’t an actual surgery, but a manipulation of the joint where they placed the hip on its position. Noora will have a CT scan in the next couple days again for checking her hip. Please pray that the hip is now finally in the right place and that Noora will feel better soon in her new body cast. As you can see from the photo, our precious Noora is in a body cast after a successful surgery yesterday on her hip. 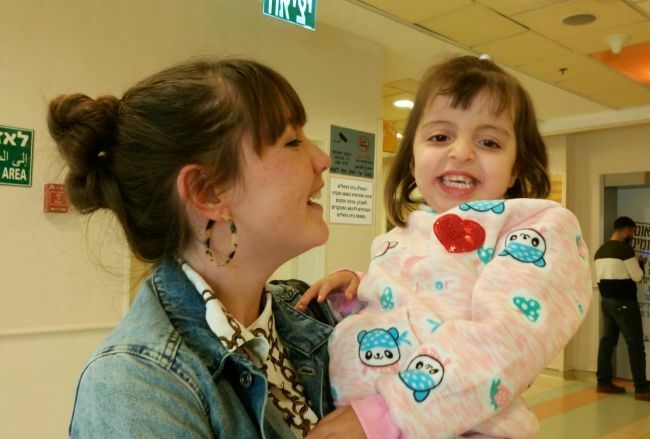 She spent the night in the ICU for monitoring, but she was moved down to the general ward as the hospital are so pleased with how she is doing. The staff are not really able to share the specific news of how she is doing, but they were able to say that generally she is doing fine. 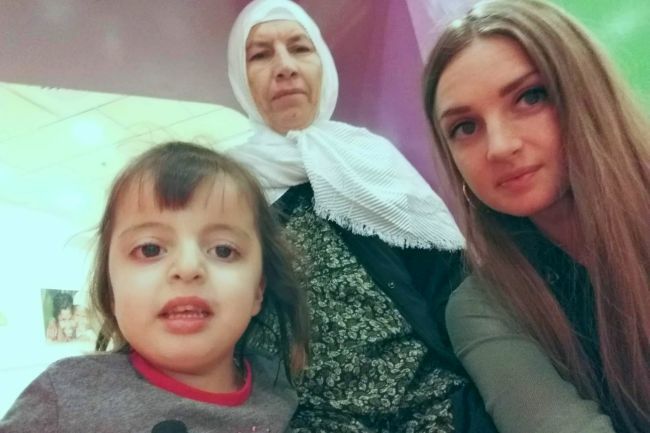 In herself, Noora was very miserable, and Grandma says she isn’t really eating very much. She cried during my time visiting her, but even so, it was so nice to see them both. Grandma seems much better now all the tears are over. We don’t have a time frame yet for her to be discharged, but please pray for her recovery, and also that Noora will be able to cope well with the new challenge of the cast, which is going from her chest, all the way down one leg and to above her knee on the other. God’s timing was just perfect today! 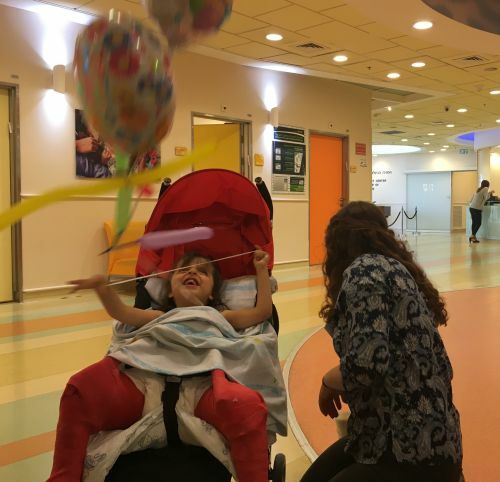 When we arrived and tried to find Noora’s room, we just met them on their way to another building where her hip surgery should be. A transporter took us there and the driver showed us the way to the operation rooms. Noora was really upset, cried a lot, and didn’t want to leave her grandma at all. 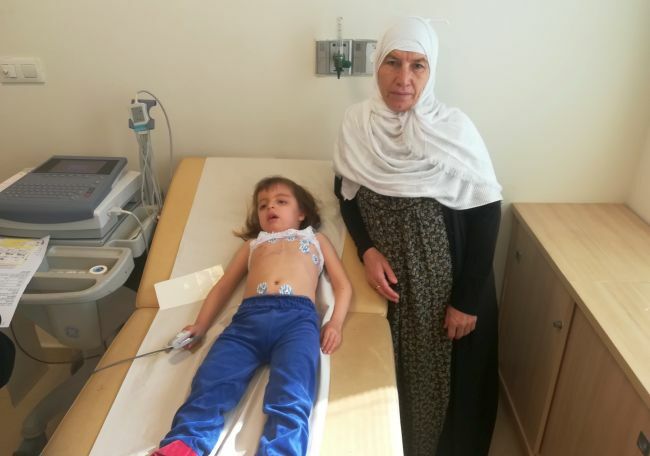 She was scared because she knew the pain of all the procedures happening in the hospital from her heart surgery. It took us some time to get through administration protocol until the surgeon and the nurses agreed that the grandma’s consent is enough for going forward with the surgery. Grandma stayed really strong for Noora all the time and tried to calm her down, but as soon as Noora was into surgery she started crying and seemed really worried about her granddaughter. Noora’s dad called a few times during the long waiting time and always asked if there is anything new about her. After six hours of waiting the doctor came finally out to tell us that the surgery went well and they got all the steps done they wanted to. He just mentioned that there is a chance the the hip is still not in the right position, so they are going to do a CT scan tomorrow or the day after tomorrow. Depending on the results of this scan they will have to do another surgery for her to correct the hip. 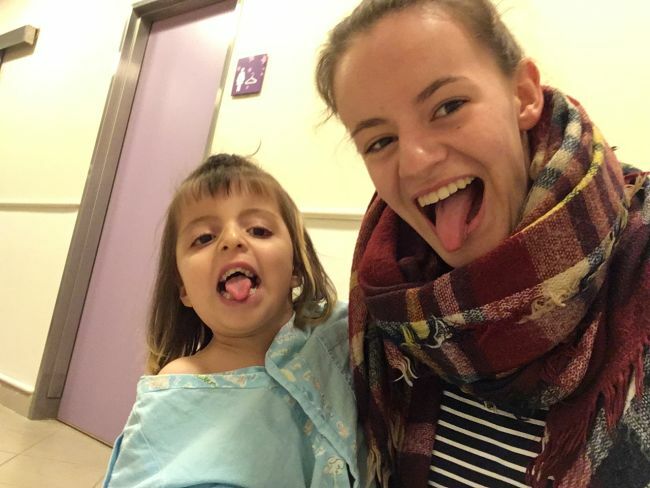 Noora was doing already really well after the surgery, she just was still a little dizzy from the anasthesia. Her grandma was so happy, although at the same time she was tired from the long waiting and worrying. Tonight they will keep her in the ICU for watching her and if she’s doing better tomorrow, she can change to the normal department. So please pray that Noora will recover soon and that her hip will be right at the position where the doctors are hoping to. Please also include her parents as they can’t be here during this time for Noora. It was an early start for me, Svea, Noora and her grandma. Despite the hour, there was a little line of mums who woke up to come to the door to wish them farewell. Haji kissed them and cried, and we headed to the car. And then, another sweet sight, as the lovely little cluster of “the Bahdini mums” braved the chilly morning and came outside to wave Noora and Grandma off. 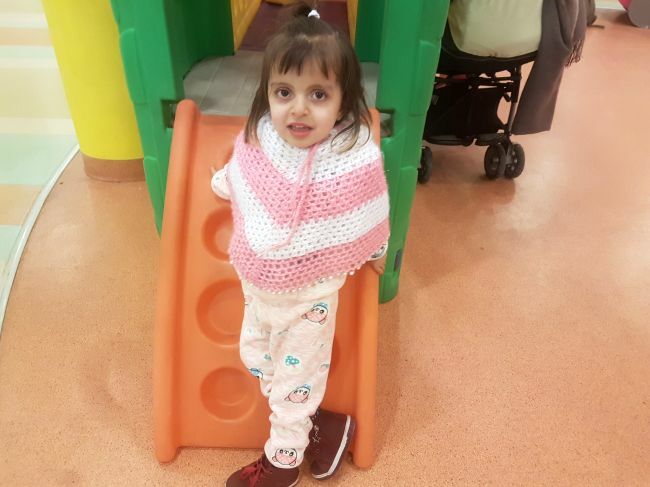 Lovely Noora was a perfect patient for the process to be admitted for orthopaedic surgery tomorrow. 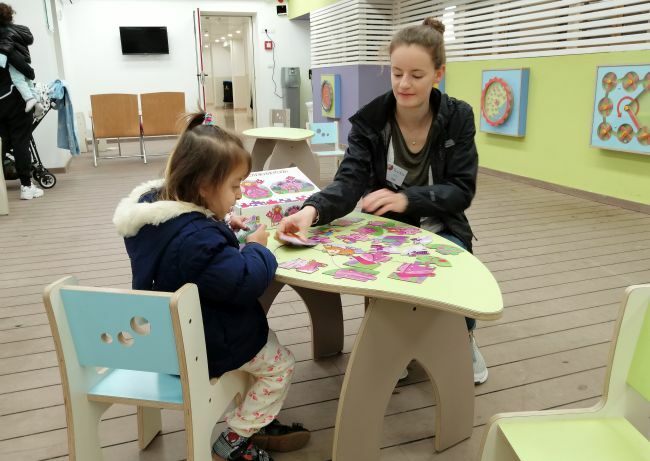 Unlike with the familiar cardiology department, patients for orthopaedic surgery need to meet with 4 or 5 different people, so Noora’s sweet nature seemed even more of a blessing today. 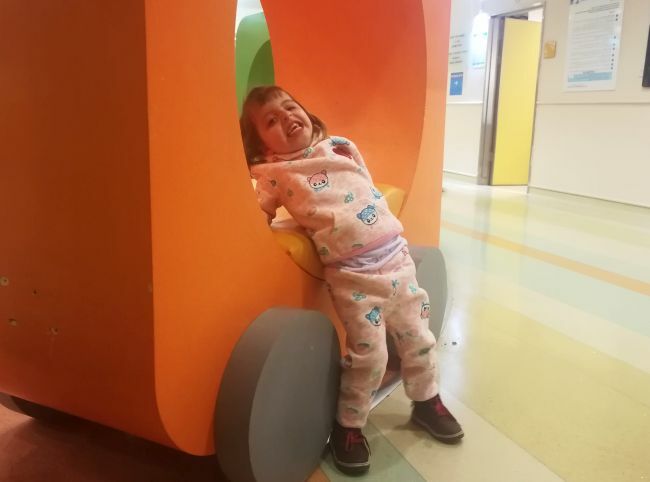 For the most part of the day, she happily joined in with examinations and tried chatting a bit with the doctors saying “OK!” and giving thumbs up. One of my favourite things about having Noora here with us is being able to see the genuine love and affection which her family have for each other. As ever, there was contact throughout the day with Noora’s father on video chat. 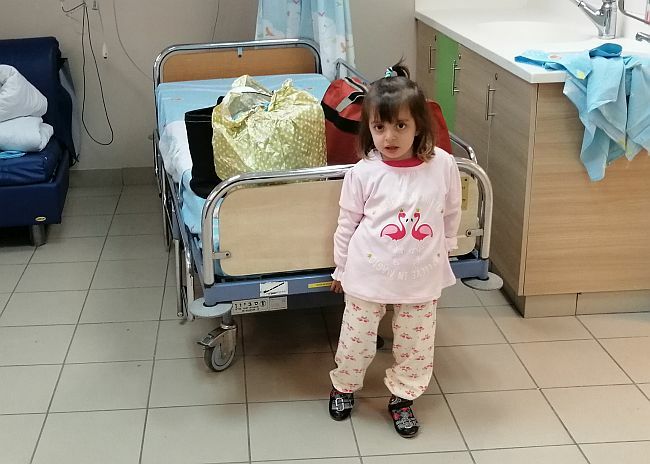 The doctor needed to ensure that he consented for the surgery on behalf of Noora, and so this led to one of the elaborate multi-person translation situations, which we get ourselves into every so often at Shevet. I love the way that God always provides a way for the right outcome; it is not always smooth and polished, but each time, it reminds me that we are working as a family, with people with a loving connection giving what they can to help the needs of another. And, I really see the beauty of the Father in times like this. Today this involved phone call chains between me, the doctor, Grandma, Noora’s father in Kurdistan, Dr. Fitoon translating into Kurdish from India, at one stage even Fitoon’s mother, and at various points also Mohammed’s father, who has recently returned from Israel to Kurdistan. All of these helping to pull the translation together to help lovely Noora to be able to get the surgery so that she will be able to walk in the future. And so, the doctor was able to describe the surgery which Noora will have tomorrow so that Grandma and Noora’s father could understand; it is a very typical surgery, but for Noora it’s complicated by the fact she is now 4 years old, and the surgery is usually carried out before a baby is 1. 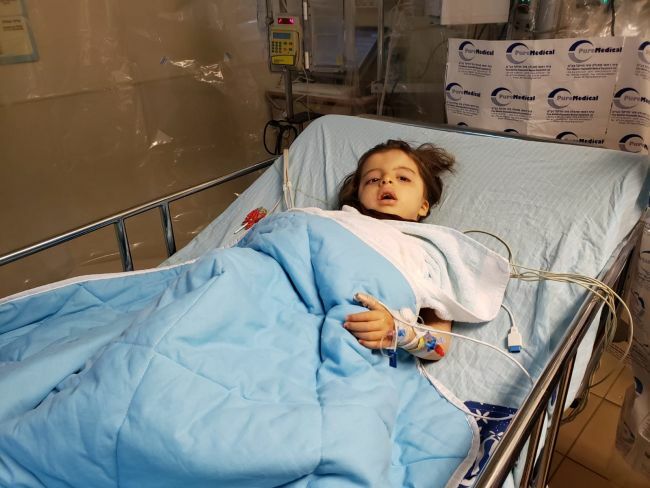 The doctor explained that they will make 3 incisions, amending the hip socket, breaking and shortening the thigh bone, and also working on the muscles to ensure they will continue to work well. Noora’s father expressed his gratitude to the surgeon, and said how he places Noora in the hands of God. The last thing I want to share with you about today is so we can join together in prayer. 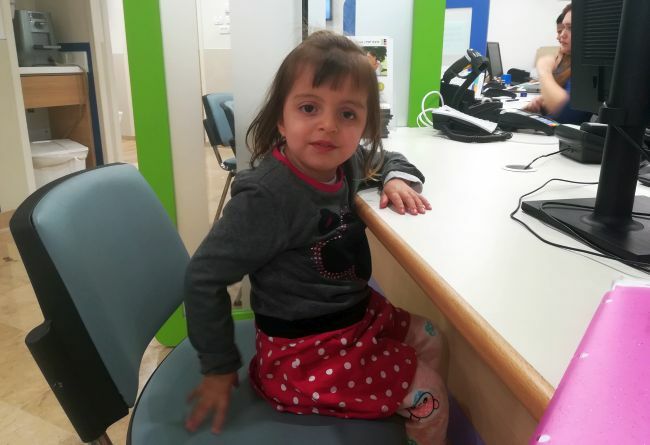 Noori was very upset when she had to wear the hospital pyjamas and even more so during her blood test. It took 4 of us to help holding and comforting Noora so that the nurse was able to draw her blood. She screamed and cried for the whole process. Grandma remained strong as her tears fell onto Noora also. Its such a distressing time, but poor Noora seemed so deeply upset for a very long time afterwards. Please pray for her that she will have peace and not to remember this which she has found so upsetting. Pray for His hand to be upon her and protect her during the surgery tomorrow, and that it will be successful. Praise Him for working so beautifully and pouring out his love into Noora and her family. When I came to visit Noora and her grandma with Mohammed’s dad, they were very happy to see us. We talked with them and Noora did some video chats with her dad. She was very cute and almost like always. Also Bella and Noora are roommates so their guardians are very happy about that. Noora is doing a lot better today but she needs to stay in hospital for now. So we hope that she can come home soon. 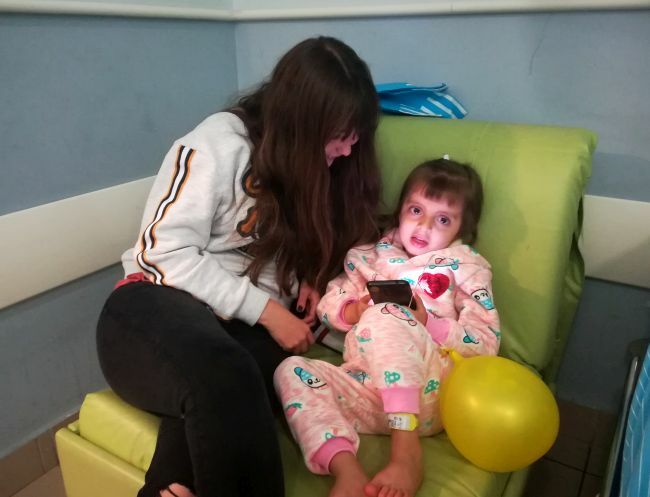 Our sweet Noora is back in the hospital. In the middle of the night Noora started feeling ill and had a fever. 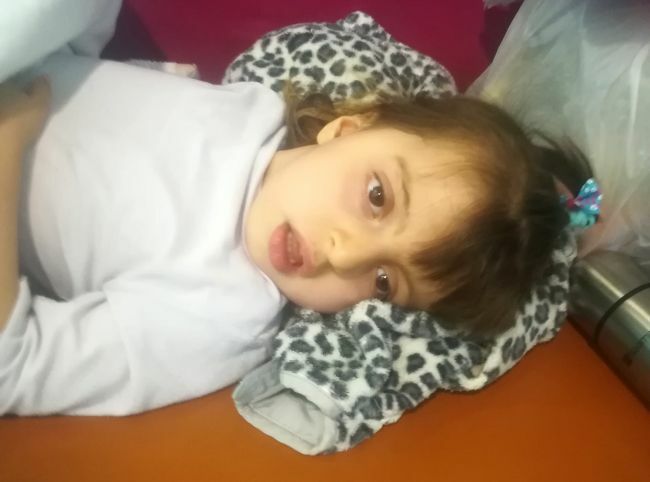 This morning Noora continued with fever and stomach pains. She wasn’t active, which is abnormal for this sweet girl. She cried a lot, vomited her medicine, and had an episode of diarrhea. We then made the decision to take her to the Emergency Room. When we arrived to the ER, Noora either slept or just stayed on her grandma’s lap. She cried a lot through a blood test and IV, and received some more anti-fever medicine. 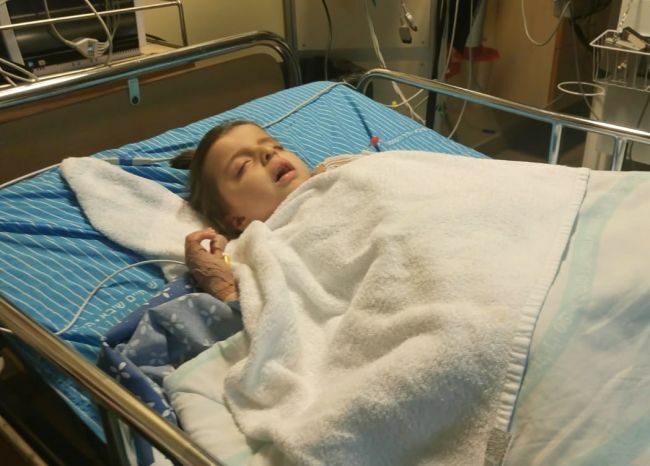 After the blood results came back the medical staff determined Noora needed some IV fluids and antibiotics. They also ordered a chest x-ray. Noora continued to be upset through it all. The doctor determined her to have gastroenteritis. Thankfully her chest x-ray was fine. She was admitted for IV fluids, antibiotics, and observation. We are hopeful it will be just for a few days. The medical team was very nice throughout this experience and was very happy to practice their Spanish with me (Diana). We waited around 20 minutes for an inpatient room, and once admitted they took a few more samples to test. She was sleeping as I left. Pray for her healing and rest. Noora had another echo today at the hospital. This went very smoothly, and confirmed that her heart is looking good. She isn’t on any medicines, and the doctor is happy for her to go ahead with another surgery for her hip. If she wasnt due to have this hip surgery, then she would be cleared to travel to Kurdistan at this point. 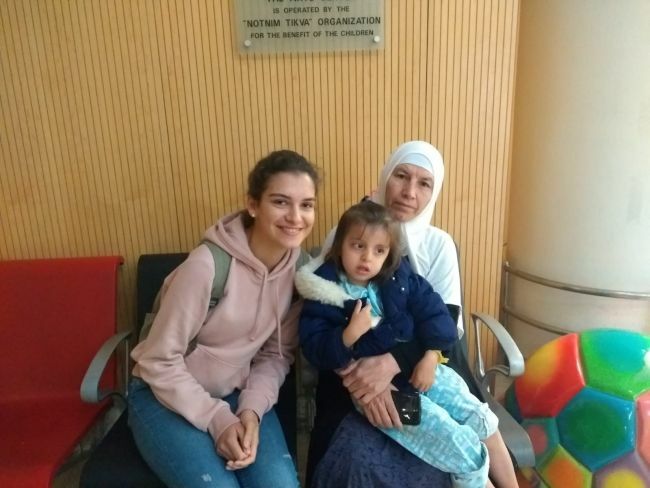 Noora’s grandma was very happy, and she spent the rest of the time in the hospital taking pictures to send home, chatting with her family on video chat and the other Kurdish mums in the hospital, as we got some other administrative bits and pieces sorted out. 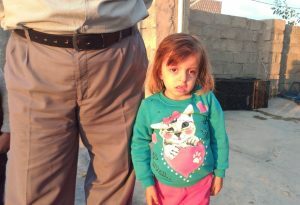 Please pray for news of Noora’s hip surgery soon, and for God’s financial provision for this. 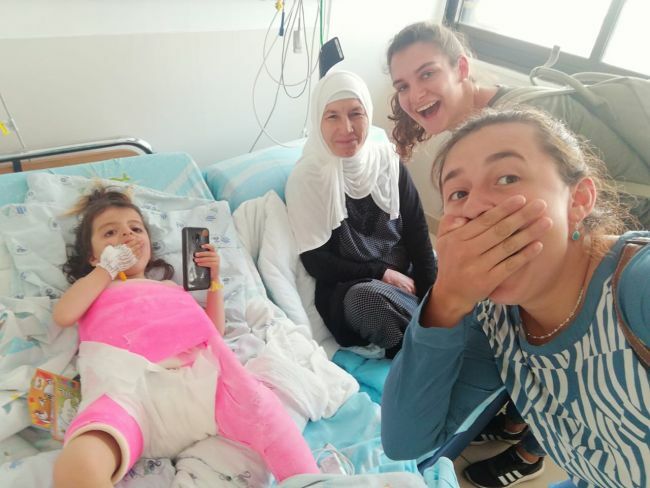 Now that Noora seems to be doing so well with her recovery from her heart operation, the next thing on her family’s mind is her hip. 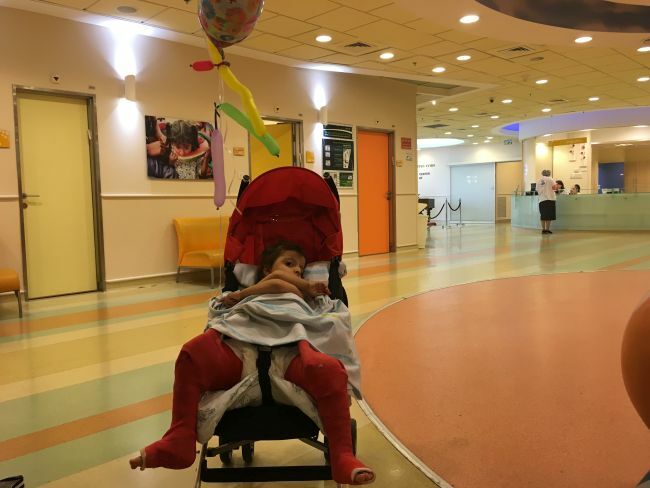 They are hopeful that Noora would be able to have surgery while she is here to correct her dislocated hip. 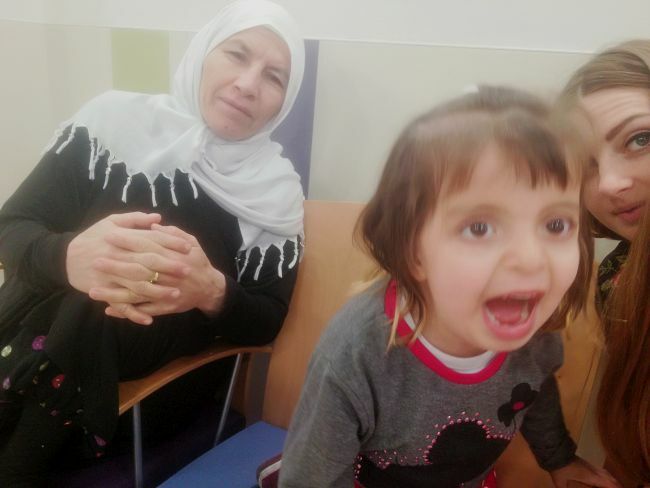 Noora’s grandma waited so patiently all the morning for the appointment with the doctor. We also had some time to video chat with Noora’s dad. It is so nice to have a little insight into this family. The appointment itself was not too conclusive at this stage, and we need to come back again to speak with the head of the department on Thursday. 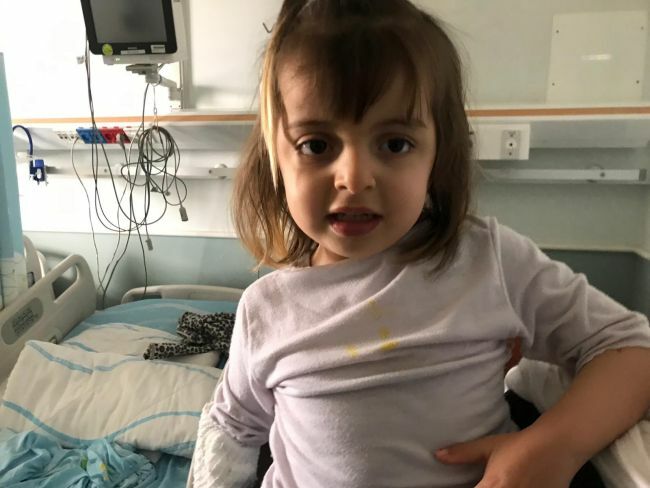 The proposed surgery would be more risky of having complications than usual because the surgery is typically done for children at around 1 year. 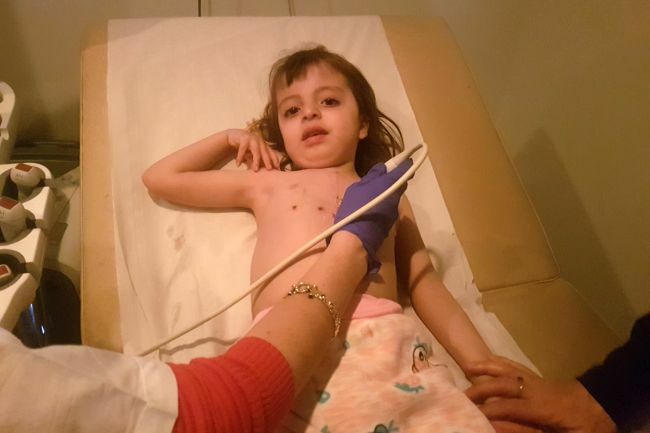 Noora is now 4 years old, and hasn’t been able to access any surgery before now to help her. Please pray that the appointment on Thursday will give greater clarity about the plan for Noora. Our girl has been discharged from the hospital today! I think everyone shares how much of a joy it is to see Noora and her grandmother, so it’s extra special to be able to bring them home. They are clearly well loved by all the nursing staff who all wished them well as we left this evening. Please pray for lovely Noora, for a full recovery. She needs to be seen next week in cardiology clinic and also to have follow up for her hip. Sophie and I had the joy of seeing Noora in secondary ICU today. She is already there, recovering well after her surgery on Thursday. She was a bit sleepy and not quite herself yet. But her grandma was so lovely, and covered us in kisses. 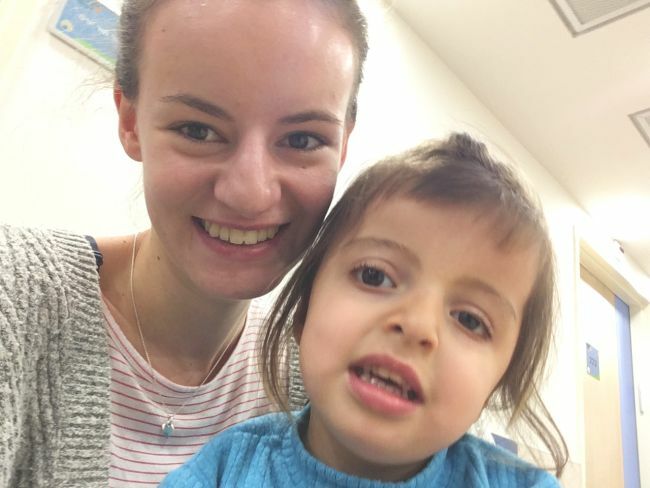 She wanted to know all about life back at Shevet, and in particular, how Karwan’s trip to Jerusalem was. She has been to Mecca herself, and is very much looking forward to visiting Jerusalem also. She is delighted that Noora is doing so well. She insisted on video calling the entire family, and we shared in their joy. We were given the full tour of their home via video as well. It is lovely that Noora has such a loving family behind her. 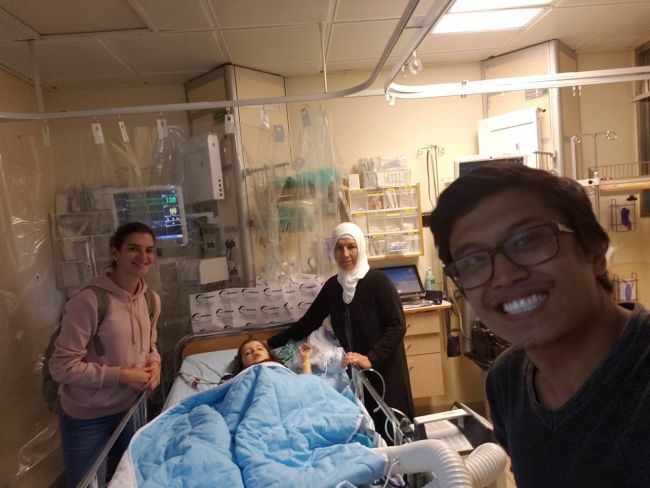 Keep Noora in your prayers, as she continues to recover. Pray for her grandma and her family to have a revelation of Jesus. Today, after a long wait, Noora finally received her surgery. In the doorway to the operating room, Noora was still really unconcerned. 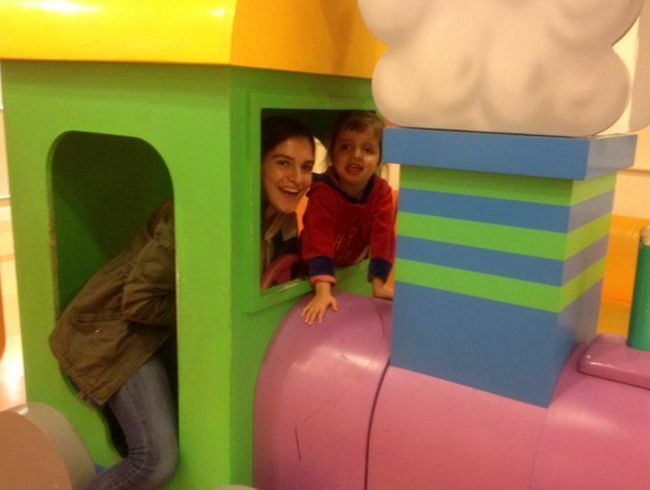 With her childish happiness and curiosity she explored her new surroundings and had fun, as you can see in the picture. 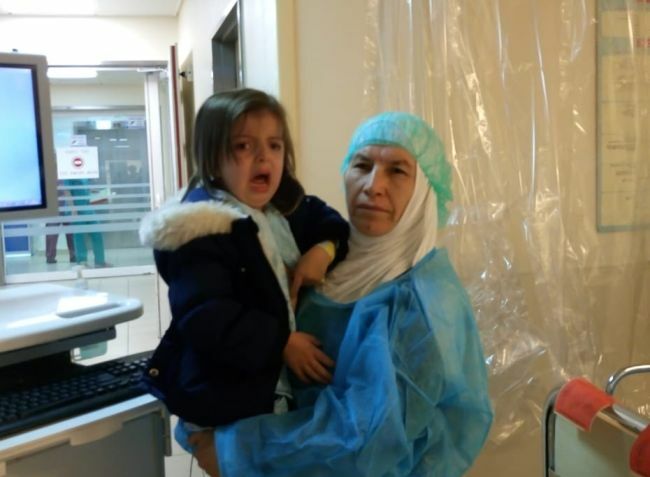 When the surgery were about to begin and her grandmother had to leave her, she became very worried. During all the time waiting, she cried a lot and prayed more frequently. And then, after a few hours, the surgeons came and told us good news! The surgery went well and Noora probably won’t need any more surgeries for her heart. Her grandmother was really full of praise, kissing and hugging everyone. 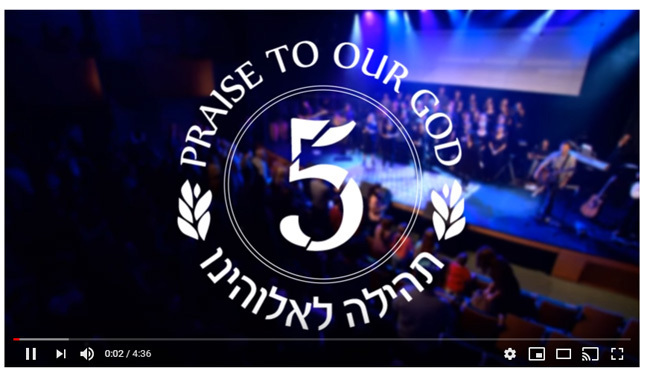 She also spoke a thankful blessing over Shevet and everyone contributing to this organization. What a blessing to serve such grateful people! Please thank God, but also pray for the next 24 hours to go well. We have just left sparky little Noora and her lovely grandma at their room in the hospital. We got notice today to bring her in to be admitted for a surgery tomorrow. The surgeon briefed the grandma on the surgery, which Julio was able to translate. He says this is a very common surgery, to close a hole, and to repair a ventricle. 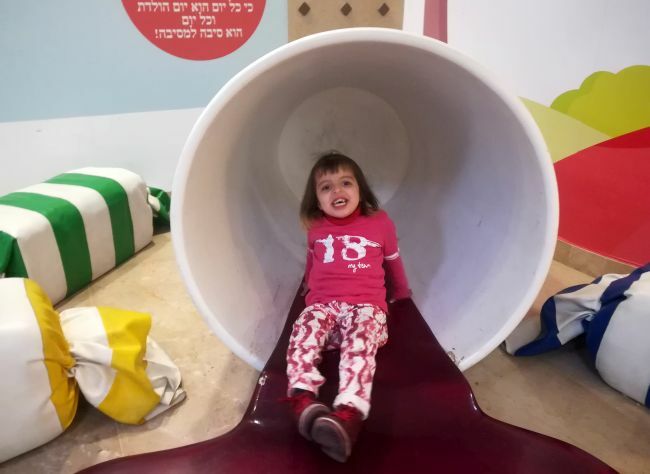 Noora enjoyed her time on the play equipment in the waiting area. 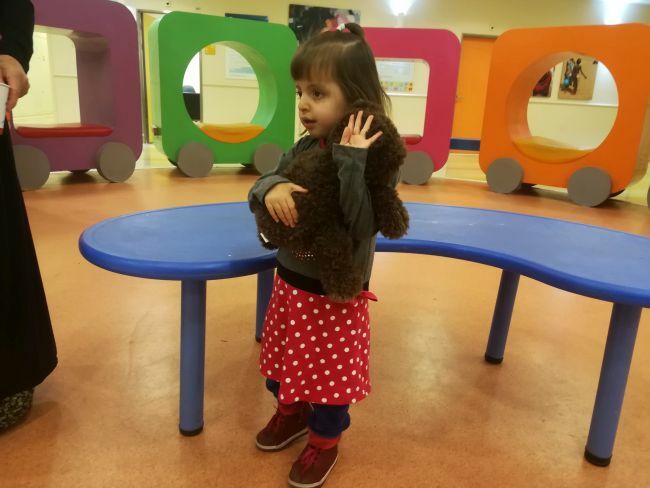 Noora has been admitted into a ward with some extremely friendly and helpful nursing staff. Her grandma cried a little as we kissed goodbye, and we are reminded that this is such an emotional time for the whole family. Please pray for her in these overnight hours before her surgery first thing in the morning. Today we went to the orthopedic department for an x-ray of Noora’s hips. Her hip is completely out of its place; it’s the result of hip dysplasia that’s not been treated. Dr. Sherr said that it is better to do this operation when the children age is 1, not older. But he also said that they will be happy to do it here. We need to wait until after the heart operation is done then he can see her again and decide if they will do the operation. 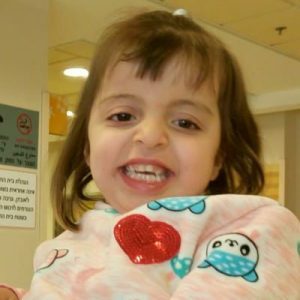 Please continue to pray for wisdom for the physicians so they can do what is best for Noora. Today, we did not visit the hospital for a cardiac appointment. 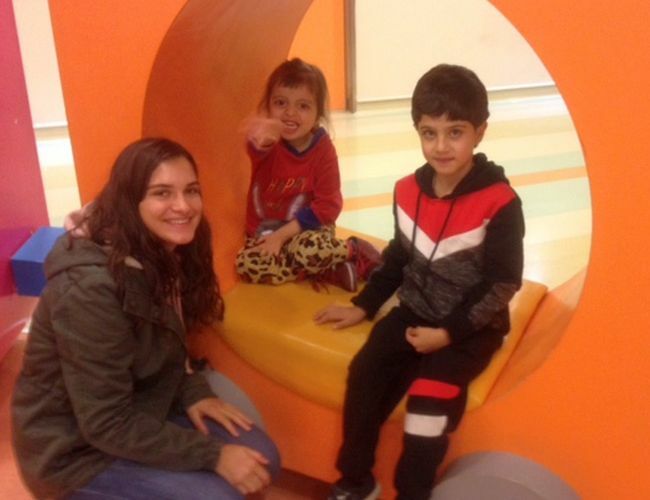 This time, we headed to the children’s department of Orthopedics. Unfortunately, Noora has limped since she learned to walk and she also squints. The cardiologist sent us to the orthopedic specialist at her last and first appointment to find out about her overall wellness by examining her bone structure. When we reached the reception, there was already a large amount of children waiting for their appointments. We joined them and really had to wait a long time. During this time, Noora and I became good friends. We played with small motorcycles, explored the waiting area, took pictures, talked with her Dad via video call, but also just sat and waited. She is a really cute and trusting girl. After a long time of waiting, the orthopedist finally called us in. After talking, letting her walking before him and examining her hips. He told us his results. 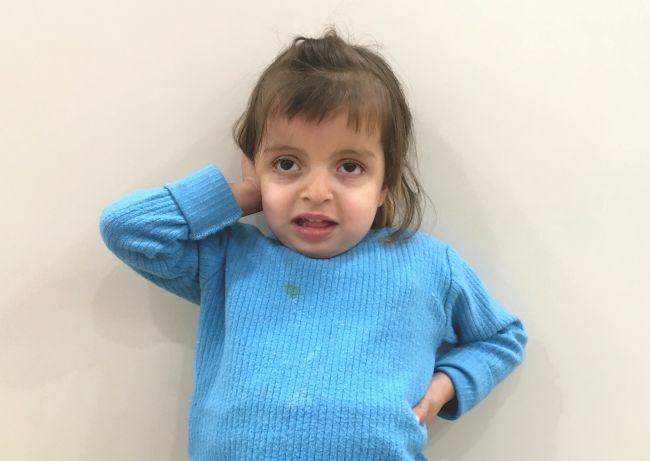 Noora was born with a dislocation of her right hip. She will have another appointment with the orthopedist next Thursday. They will also do an x-ray on this day. 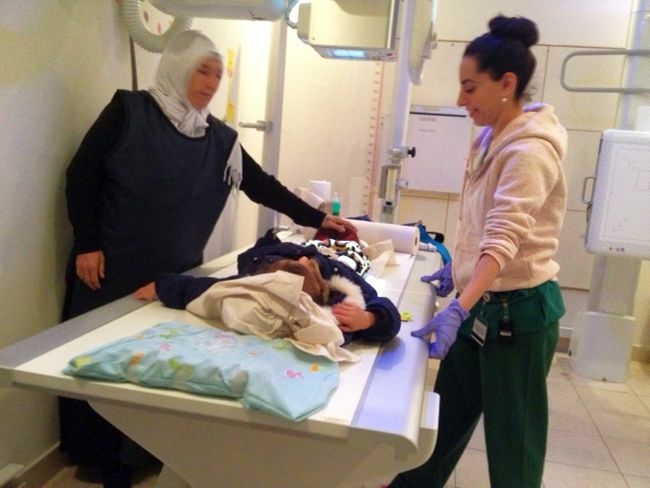 After the results, they will have a meeting with two orthopedists, Noora and her guardian to talk about her options. In general, this dislocation will not hinder her having her cardiac surgery before treating her hip. 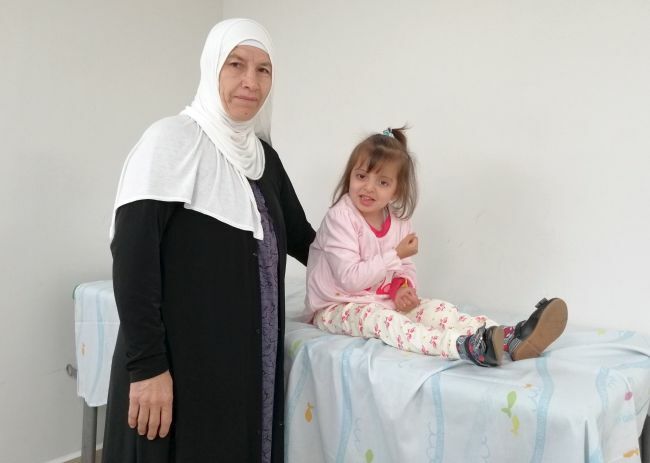 Please pray for little Noora and her grandmother, as she may need orthopedic treatment in addition to her cardiac surgery. Please also pray for the doctors, who do have to plan and cooperate. May God give all of them peace and patience, especially her family. 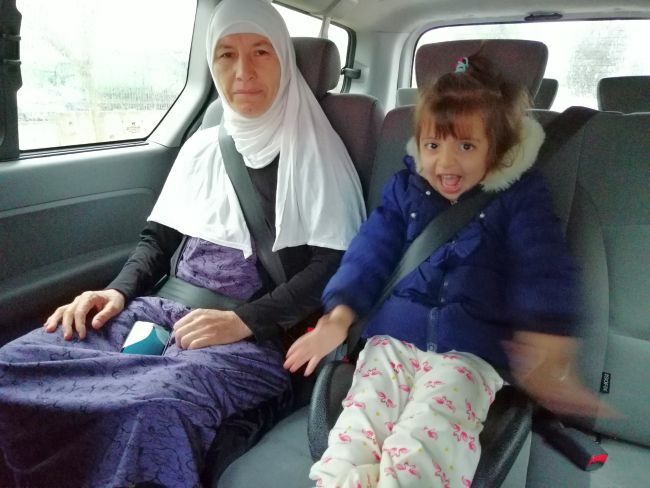 Noora and her family fled from their home during the Islamic State invasion of Iraq in the summer of 2014. They’ve built a cinderblock home in their new location, but the walls are still unfinished and they are sleeping on thin mattreses on the cement floors. On their own they do not have any hope of getting Noora open-heart surgery, which will allow her to grow up and have a normal life. 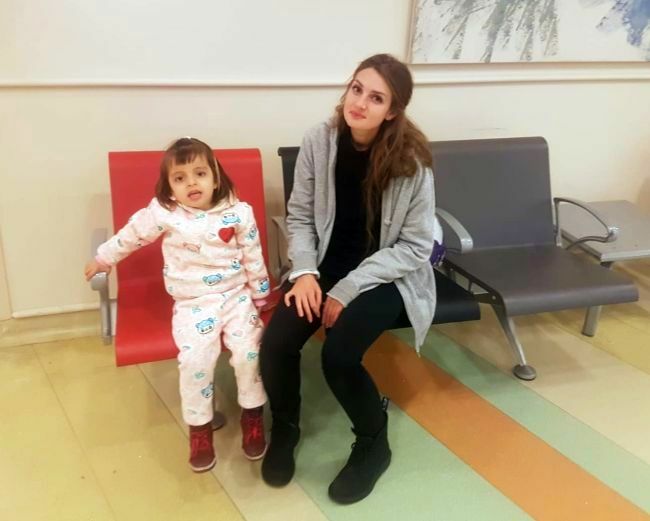 Noora’s visa to Israel has just been approved, and we hope she will travel by the first week of December. 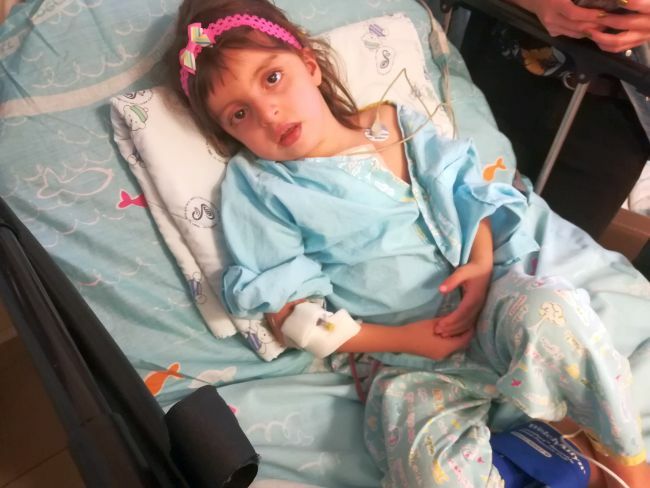 As of right now, Noora still needs $9279 toward surgery and related expenses.